"Not for me," says independent, freedom loving youngster. Fortunately, the efforts to force feed kids unappetizing slop in the name of health has backfired with an ineptitude typical of all bureaucracies. 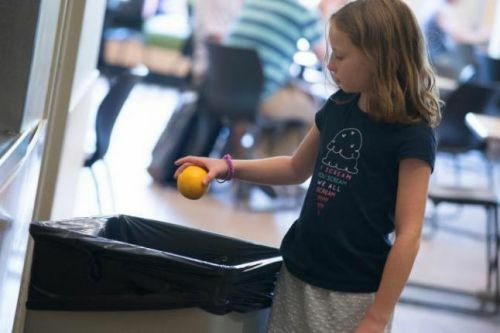 A new study reveals that children, forced by law to receive a portion of fruit with their school lunches, have been cheerfully throwing the unwanted portions of their meals in trash cans before even sitting down to eat. Never underestimate the intelligence of teenagers. For all it’s ill-conceived do-goodery, it turns out government can’t actually control what we eat… yet. Instead, it gets to waste taxpayer money on the purchase of food no one wants to eat, that then gets discarded only to take up space in landfills. I thought these people were supposed to care about the environment? After making the patently obvious realization that human beings don’t just blindly do as they’re told, meddling social scientists have tried shift tactics in order to “nudge” (read: trick) kids into eating healthier against their wills. These techniques include calling carrots “X-Ray Vision Carrots” and spinach “Super Strength Spinach.” In other words, since they can’t use force to make children comply, they’re going to flat out lie to them. The very concept is more disgusting than a tray full of yesterday's government-mandated vegetables. This concept of “the noble lie” was popularized by Plato more than two millennia ago to justify a totalitarian system of government, but then as now, there’s nothing noble about deceiving people in order to impose your will on them. I’d like to propose a radical alternative to centrally micromanaging people’s lives: how about we treat individuals with respect, and recognize that free people in an enlightened democracy should be able to make their own choices? Why not let families decide what diet is appropriate for their children? Surely they have a better understanding of their own needs than the First Lady does. With the insulting paternalism with which government treats its citizens, it’s no wonder parents are abandoning public schools and adopting alternative approaches to education in record numbers. I worked for the school district for years and If the government said no mustard for sandwich they didn't get mustard for their sandwich. That's is just one of many rules. right. Teenagers throwing away fruit is a good thing. Oh, the evil government. Do you actually think about what you write? It sounds like parody. People like you do more damage to the ideas they support than even the most persistent of opponents. If you have nothing to say - don't say anything. It's ok.
All I heard is derp, derp, derp. You missed the whole part about where schools are legally forced to serve this stuff? I think what he is trying to point out is the fact that the government, is literally, throwing away money. Like they do with so many of their programs. This is one of the reasons we are in debt. You want to serve fruit? Great, let the ones who want it have it, and those who don't, don't. No its much more easier to try to force someone to do it, and when they refuse, the next step obviously is to punish them. Look at the bigger picture. Throwing away fruit isn't a good thing, but it's the inevitable outcome of trying to force people to consume what they don't want. It's satisfying to see that acknowledged.